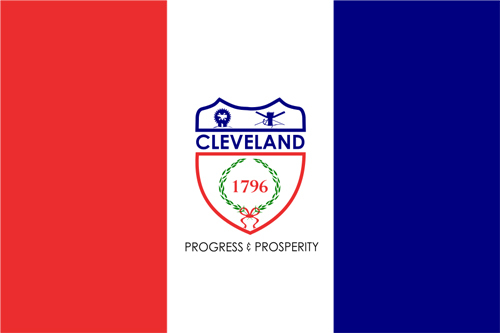 Did you know that Cleveland has it’s own flag? The Flag of Cleveland consists of three vertical stripes, of equal width, in red, white and blue respectively. The center white stripe bears the American shield with the word “Cleveland” across its center, and the year 1796 in red, at its base, surrounded by a laurel wreath. The outline of the lower half of the shield is in red and of the upper in blue. In the upper left-hand corner of the shield are an anvil, hammer and wheel, and in the upper right-hand corner an anchor, windlass and oars. Under the shield it says “Progress and Prosperity” but that is not the city’s motto. The Cleveland flag was designed in 1895 by Cleveland high school student Susan Hepburn. She won a competition. Moses Cleaveland founded the city in 1796 and the red, white and blue are, of course, patriotic tributes to the United States flag. The student included the anchor, windlass and oars to represent Cleveland’s major role as a port on the Great Lakes. On July 12, 2018 a delegation from Rouen, France led by led by Mayor Yvon Robert met with Cleveland Mayor Frank Jackson in the Red Room and Mayor’s Room at City Hall. Rouen is a Sister City with Cleveland and the Rouen delegation visited to celebrate the 10 year anniversary of this relationship. Mayor Jackson was asked about the Flag of Cleveland and Martin Hauserman, Chief City Archivist, Cleveland City Council, explained its origin and meanings in this video clip.